An eighth-teaspoon in the mornings and eighth-teaspoon at bed time massaged on a rotational basis from day 14 of your cycle to day 28, then stop until day 14 of your next cycle. An eighth-teaspoon in the mornings and eighth-teaspoon at bedtime (or 3 pumps in the morning and 3 pumps at bedtime if using our pump bottle) massaged on a rotational basis from day 14 of your cycle to day 28, then stop until day 14 of your next cycle. Count the first day of bleed as day one of the cycle. If your cycle is not the usual 28 day cycle, then use the cream as above from the mid point of your cycle to the end (i.e. if your cycle is every 24 days use your Wellsprings cream from day 12 through to day 24, and then stop until day 12 of your next cycle). 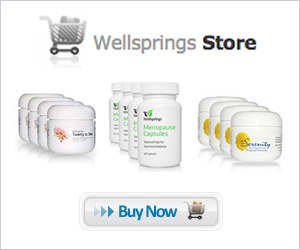 You may wish to try cutting out HRT immediately at the outset of using your Wellsprings cream or you may prefer to phase out the HRT over two months. To phase out HRT you must determine whether the HRT you are taking is an oestrogen and progestin combination and, if so, change to an oestrogen-only HRT treatment. (The combination of Natural Progesterone at the same time as a Synthetic Progestin is to be avoided). In the 1st month of using your Wellsprings creams and oestrogen-only HRT together halve the dosage of HRT (to half of the normal HRT dosage). In the 2nd month halve the HRT dosage again (to a quarter of the normal HRT dosage). In month 3 cease HRT altogether.